In just a single application protect wood flooring from moisture vapor emitting through concrete slabs and get excellent sound-reduction benefits with Ultrabond ECO® 985. MAPEI® Ultrabond ECO® 985 is a premium single-component, hybrid-polymer-based wood flooring adhesive formulated without water, solvents, amines, isocyanates, phthalate plasticizers or epoxy resins. 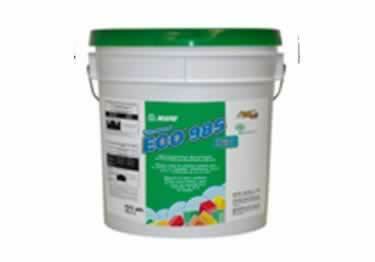 Formula based on rapidly renewable raw materials and has extremely low emissions of volatile organic compounds (VOCs). Great for interior use in residential, commercial, and institutional applications like apartments, office buildings, convention centers, schools, and more. Durable, great for use in residential, commercial or institutional applications. In just a single application protect wood flooring from moisture vapor emitting through concrete slabs and get excellent sound-reduction benefits with Ultrabond ECO® 985. MAPEI® Ultrabond ECO® 985 is a premium single-component, hybrid-polymer-based wood flooring adhesive formulated without water, solvents, amines, isocyanates, phthalate plasticizers or epoxy resins.